You'll find Townie Frozen Desserts at the Braintree Thanksgiving Holiday Farmers Market on Saturday, November 17th at Braintree Town Hall. We'll have a great variety of our vegan, non-dairy, nut-free Townie ices, sorbets, and ice cremes to scoop for you. But, you don't have to be vegan to love Townie. It's refreshing and delicious! Enjoy a little or big serving as you shop the market or take home a pint for dessert. We'll also have half-pint jars of our fabulous Townie Toppings as well in Good Old Chocolate, Spicy Hot Chocolate, and Smooth Caramel. They make great hostess gifts! Come see us! Are you a Townie? You'll find Townie Frozen Desserts on the first Sunday of every month this season at the fabulous Kingston Farmers Market. We'll have a great variety of our vegan, non-dairy, nut-free Townie ices, sorbets, and ice cremes to scoop for you. But, you don't have to be vegan to love Townie. It's refreshing and delicious! Enjoy a little or big serving as you shop the market or take home a pint for dessert. We'll have half-pint jars of our delicious, delectable Townie toppings as well in Good Old Chocolate, Spicy Hot Chocolate, and Smooth Caramel. Come see us! Are you a Townie? 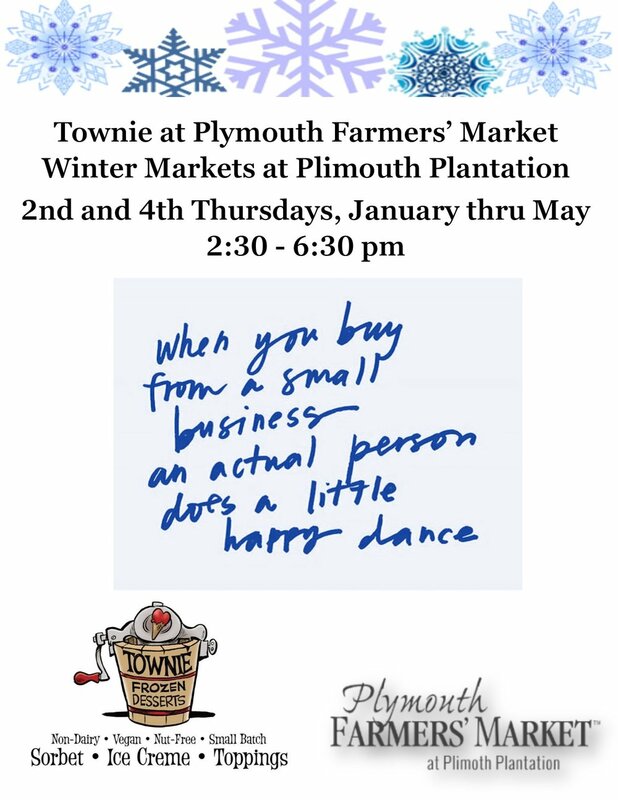 You'll find Townie at the Plymouth Farmers Market every Thursday for the season. We'll have a great variety of our vegan, non-dairy, nut-free Townie sorbets and ice cremes to scoop for you. We’ve got new fall flavors and our fabulous toppings in Good Old Chocolate, Spicy Hot Chocolate, and Smooth Caramel - all vegan, non-dairy, and nut-free. But, you don't have to be vegan to love Townie. Everything we make is simply delicious! Enjoy a little or big serving as you shop the market or take home a pint for dessert. Come see us! Visit www.plymouthfarmersmarket.org for more information. For more information about us, visit our website at www.TownieFrozenDesserts.com. 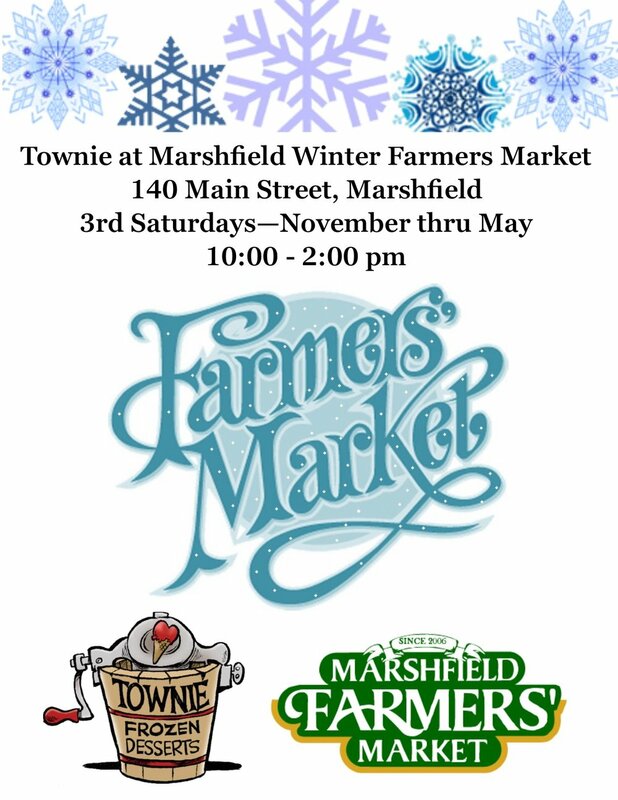 You'll find Townie Frozen Desserts at the Braintree Farmers Market every Saturday for the season. We'll have a great variety of our vegan, non-dairy, nut-free Townie ices, sorbets, and ice cremes to scoop for you. But, you don't have to be vegan to love Townie. It's refreshing and delicious! Enjoy a little or big serving as you shop the market or take home a pint for dessert. We'll have half-pint jars of our fabulous Townie Toppings as well in Good Old Chocolate, Spicy Hot Chocolate, and Smooth Caramel. Come see us! Are you a Townie?